Because wild boar's child had been obtained from the fisherman, dismantlement and the dish were done. It was possible to do comparatively easily because it dismantled, and it had cooked once before. The dismantlement of the wild boar was recorded. 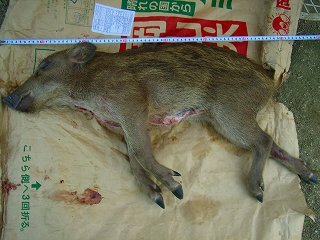 It is a Japan wild boar that it is in Japan. It is nervous and it is cautious. The purpose of this is the mud bath and might bathe in rice field drop the helminth such as ticks that adhere to the body and adjust the temperature. Moreover, it is from a reason similar as for the rub of the mud that places to the body against the tree trunk. It often acts at night when man doesn't act though it acts in daytime. It is an insect, a river crab, an earthworm, and a loach in omnivorous and the plant in fruits, the underground stem (The bamboo shoot is a large favorite dish), and the animal. Eat heating it enough because it might have the hepatitis E virus. The vicinity where the sweet potato in the field had been eaten many times by the wild boar seems to have requested the wild boar to capture from the hunter. 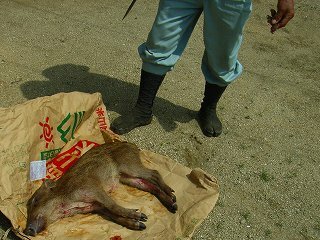 The child of the wild boar that was able to be caught of the hunter in wild boar's trap today, and brought it. It was possible to catch, the blood pulling out was done at once, and internal organs was taken. The hunter cut out wild boar's tail evidence to exterminate. He has it in the left hand in this photograph. Length from the head to hips was about 70cm. Because internal organs has already been taken, it doesn't weigh oneself. The meat after it had dismantled it was about 3.5kg. Do the child still and the striped pattern like the melon remained in the hair of the back. It dismantled it thinking that I should eat at least for the dead wild boar though the dismantlement of the wild boar was too reluctant. Because the photograph under dismantlement was not cruelly seen easily, I did not take it. The blood pulling out and internal organs are taken. It seems usually to do the blood pulling out at once though it did not do this time because the blood pulling out and internal organs have already been taken. It seems to cut the blood vessel of the neck in the heard story and to soak it to the stream. It ..putting out.. applies [ha] kitchen knife ahead between the skin and the muscle and the skin is separated. Meat lives about the skin if not becoming accustomed for a moment. There were usually few subcutaneous fats because it was child's wild boar though there was a subcutaneous fat. It goes well when doing in feelings that cut the skin. The skin cuts if it does too much strongly. It is possible to cut it well by putting the tip of the blade of the kitchen knife in the part of the joint with meat adhered. The bone need not be cut. Because I have been experiencing the dismantlement dish of the chicken many times since childhood, the knack around here is known. Meat is separated from the bone. Big meat separates from the bone little by little. Taking small meat that places to the bone after each bone is boiled goes well. Because it is not possible to eat, everything is subdivided small at a time, put in the vinyl bag, and frozen. It defrosts and it is used only to use it when using it. I think that I switch off and do the Japanese pampas grass easily then in the state of a half decompression. Wild boar's meat is generally hard and the smell is tight. I also had had such a preconception up to now. I think the smell to be strong if the blood pulling out is not made well. Moreover, the smell might move to meat by the element of internal organs when internal organs is damaged. Meat seems to become soft boiling the hardness of meat for a long time. Never eat in the life because the wild boar often has the hepatitis E virus. Please cook heating it enough. Wild boar meat is called cholesterol is more than pork vitamin B1, and few, healthy meats.